Here for you is the Bicycle Color Collection. 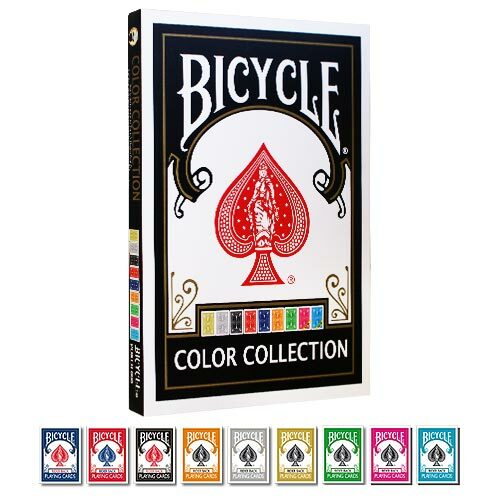 An elegant maxi-case enclosing 9 regular Bicycle poker size decks in 9 different colors. Get our Bicycle poker decks (rider back) at an unbelievable price. Included in this case you will find 9 Bicycle decks and two professional close-up pads (1 black and 1 red). Bicycle Color Collection is a worldwide exclusive by Vincenzo Di Fatta. • The close-up pads included are standard size (cm 40 x 27,5) and professional. They are made of two layers: non-slip rubber under, and soft fabric above. Out of the 9 decks enclosed in this maxi-case, 6 are Vincenzo Di Fatta’s worldwide exclusive, realized in collaboration with The U.S. Playing Card Co. • The colors of the 9 decks are: Blue, Red, Black, Orange, Silver, Gold, Green, Fuchsia, Turquoise. • The maxi-case looks like a super jumbo Bicycle case. The maxi-case is cm 45 x 32,5 x 3,5 (in. 18 x 13 x 1,6).